Businesses and their distributed enterprise locations grow more dependent on connected resources every day. That’s because employee and customer expectations and behaviors are evolving and having quick access to business information or constant connection to personal applications is changing the game for business networks. Every report I see indicates that our dependence on connected systems will continue to skyrocket. In fact, Cisco recently predicted that global IP traffic is set to nearly triple by 2021. It’s no surprise given that cloud-based apps and critical business systems are becoming the lifeblood of every business, and branch offices need the same capabilities that headquarters has. At a time when businesses are reimagining and disrupting themselves, IT leaders must also reimagine how best to support tomorrow’s unprecedented and growing connectivity demands. Consider the proliferation of streaming music, video and social media in the workplace and its impact on enterprise networks. I recently spoke with a construction company that encouraged employees to access YouTube on-the-job for training resources. Unfortunately, its network couldn’t accommodate the heavy bandwidth demands, so this valuable training resource had to be shut down. In another instance, a large fitness center chain wanted to stream music and video through its treadmills and other exercise equipment for its members. The intention was to add these services to existing networks that had been handling only point-of-sale transactions. Adding the music and videos crashed their multiprotocol label switching (MPLS) networks, because, not surprisingly, they couldn’t handle the demands of those additional bandwidth-intensive applications. In California, a car dealership group in Southern California and a medical group that specializes in kidney disorders in the Central Valley required a new wide-area network (WAN) strategy to accommodate the changing makeup and delivery of both business and personal applications across their company networks. They were able to accomplish that with Comcast Business solutions. 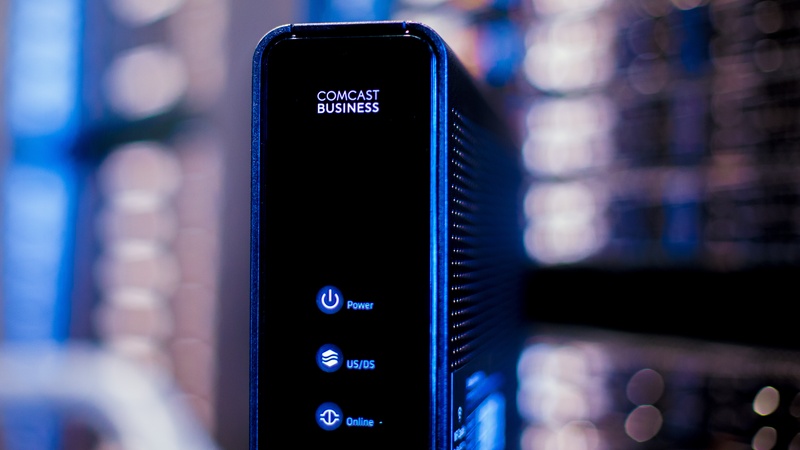 Faster speeds, higher capacity pipes and smarter connections, starting in the last mile and progressing to the core of corporate networks, are critically important to our businesses. There’s good news. The speeds we need now and well into the future are here today. A new gigabit last mile is being created that delivers lightning-fast bandwidth over ubiquitous, affordable broadband. It’s a game changer for businesses of all sizes. We still need to connect the many assets of our distributed enterprise—whether in the cloud, branch offices, a company data center—in ways that will deliver the business benefits of these widely available and affordable broadband speeds. Companies have historically relied on MPLS that is, even today, too often delivered over legacy 1.5 megabits per second (Mbps) T-1 circuits. Software-Defined Wide-Area Networking (SD-WAN), however, creates the opportunity to quickly and easily unlock the power of this new gigabit last mile. Even as SD-WAN brings a network into the future, it also enables “hybrid” configurations that allow a business to transition gracefully from its legacy MPLS environment to a gigabit infrastructure. In a hybrid configuration, SD-WAN enables network traffic to be routed dynamically across the new broadband WAN or a legacy path such as MPLS. This allows customers to begin unlocking the price and capabilities of gigabit broadband, while also creating time to comfortably migrate applications from the legacy service to SD-WAN. Any WAN is only as good as the last mile that connects it to end users in their actual business locations. Application performance, cost and overall user experience are heavily influenced by the last-mile transport chosen. As virtually every IT workload migrates to the cloud, it becomes a reality that just about 100 percent of a business’s activities traverse the last-mile connection between the users and the cloud-based applications. What’s more, having direct connections to the internet—versus backhauling internet traffic through a MPLS choke point operating in a hub-and-spoke configuration—is a much more efficient way to access applications throughout the enterprise. Of course, as enterprise traffic makes its trip across the network, those pathways must provide the performance, security and reliability that CIOs and CISOs require. As the last mile is revolutionized by widely available gigabit bandwidth, it’s critically important that IT leaders “skate to where the puck is going to be, not where the puck is” when designing and purchasing their next-generation network solutions. As basic as it sounds, the first step in selecting network transport is determining what’s available at the locations to be served: cable (fiber optic, coaxial or both) and/or cellular long-term evolution (LTE). LTE is useful as a backup transport connection today, but it should only be relied on as a primary access technology when no other cost-effective solutions are available. For absolute speed and price/performance, wireline fiber and hybrid-fiber coax (HFC) networks are the critical foundations of next-generation networks. The cost of construction and related expenses required to procure high capacity last-mile bandwidth is an important consideration in evaluating an SD-WAN plan. The capabilities of fiber optics in terms of speed are widely understood and modern Metro Ethernet networks are fantastic options for very high capacity connections. Unfortunately, last-mile fiber is far from ubiquitous—particularly outside of major metro centers—and, when available, is often very costly. HFC networks, particularly those now broadly deployed gigabit services based on the new DOCSIS 3.1 technology standard, bring massive bandwidth to millions of business locations that were previously unable to access gigabit speeds. Anyone considering a high capacity last-mile connection to power an SD-WAN deployment should be sure to assess the availability and applicability of both Metro-E and gigabit broadband solutions. Between the two technologies, IT leaders are likely to find the right mix of price and performance to power bandwidth-hungry corporate and consumer applications. How tight are the latency, jitter or packet loss requirements of the planned applications? Many modern applications are highly resilient in the face of modest network variations. Failing to understand the true requirements may lead to buying more expensive bandwidth than is actually necessary. How will a transport solution meet the business’s compliance mandates, especially in highly regulated verticals such as healthcare (HIPAA), financial services (Sarbanes-Oxley) and retail (PCI)? Are there specific accommodations, such as segmenting or layering confidential or sensitive information that must be designed into the transport and SD-WAN plan? How will the chosen service provider meet its quality of service agreements? Will a hybrid transport solution help ensure quality performance in the face of network outages? What mix of upstream and downstream bandwidth is needed to optimize application performance and bandwidth expenditure? Many cloud applications—particularly consumer applications, training, Wi-Fi and media streaming applications—drive far higher downstream capacity needs. How can traffic be classified—and how will the service provider deliver classifications—to ensure that business critical or regulatory compliant transactions always have the available bandwidth they need? A thorough understanding of the answers to these six questions, along with a comprehensive evaluation of the connectivity options that are available within reasonable costs, will set the right course to choosing the transport that strongly supports a great SD-WAN implementation for years to come. I frequently point out that our networking industry is at a generational moment, as the dual forces of SDN and gigabit broadband combine to reshape the price, complexity and capabilities of modern enterprise networks. As IT leaders tap into this next generation, it’s a critical time to lay the right foundations in terms of a new last mile and SD-WAN infrastructure.